Katherine Swartz Hilton is a pioneering social entrepreneur. She is passionate about cultivating an entrepreneurial spirit from within organizations – driving change that seeds the growth of the organization’s impact, while supporting long term sustainability. 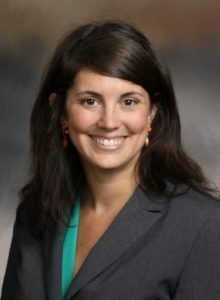 Katherine serves as executive director of the McNair Center for Entrepreneurism, Community Engagement and Women’s Business Center at Columbia College, a nonprofit liberal arts college in Columbia, SC. Together with her team, Katherine educates, coaches and connects Columbia College students and entrepreneurs across the state, propelling them from start to sustainability to growth. Since its founding in 2015, the McNair Center for Entrepreneurism has worked with more than 35 students in a prestigious Entrepreneurship Fellows applied learning program and awarded more than $25,000 in micro-seed funding to student-driven startups. Columbia College opened the Women’s Business Center of South Carolina in spring 2018 to serve the more than 160,000 women business owners in the state, while building alliances among the regional entrepreneurial ecosystems. This summer, the Women’s Business Center will embark on a statewide listening tour to hear from women about their needs, challenges and opportunities. Katherine has extensive experience working with professional associations and charitable nonprofit organizations in Columbia and Atlanta over the past 18 years – each position threaded by success in redeveloping and launching programs impacting the organization’s impact and revenue lines, while building partnerships and alliances to magnify success. Katherine is a graduate of the University of SC (BA, Mass Communications) and Columbia College (MA, Organizational Change and Leadership). She is an alum of the Diversity Leaders Initiative of The Riley Institute at Furman University, a graduate of the Non-Profit Leadership Institute at Francis Marion University, and is a certified trainer with Kauffman FastTrac and the Network for Teaching Entrepreneurship. She serves as secretary of the Richland Library Board of Trustees. Her most important roles are wife of fellow entrepreneur Gregory Hilton (SOCO, Period 3, 1 Million Cups) and new mom to Pascal Hilton (born November 2016). They live in historic Earlewood in downtown Columbia.